Lawren Harris said of fellow Group of Seven artist Tom Thomson: “those who depart before their time continue to haunt the land they loved.” The story goes that Tom Thomson, a skilled outdoorsman who spent months alone in the backcountry of Algonquin Park on painting expeditions, got caught on fishing wire, tipped out of his canoe, hit his head on a rock and died in Canoe Lake in Algonquin Park; this happened almost 100 years ago on July 8, 2017. He painted less than four years; he was 40-years-old. Conspiracy theories swirled around after his death, murder? But ultimately, whatever the real reason, he died prematurely. I felt him everywhere in Algonquin Park this past winter: I cried standing in front of his shrine in the visitor centre. 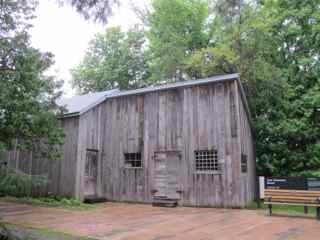 And here, at the McMichael Gallery in Kleinburg, north of Toronto, running my fingers along the wooden shack where he painted his great works such as the West Wind, I inhale deeply before feeling the tears on my face. I can’t help it. Transported entirely, piece-by-piece, from Toronto, this shack is where he spent all his time when he wasn’t in a canoe. Described as intense, dark and resourceful, and someone who had a primal vision of nature, Tom’s life is symbolic of an artist. He was shy, but he was so filled with self doubt that one time he threw his paints into the woods. But he knew the outdoors and he certainly, despite his doubts, knew his art. Hiking through an Ontario winter trail, I’ve seen that blue shadow on the snow; in the Georgian Bay, when the winds threaten to knock you out of your canoe, I have felt those West Winds that slant the trees. In the past few years, the stronger my connection to Ontario grows, and the more I explore, the stronger it grows for Thomson; the two are the same for me. In his paintings, I see the Ontario he saw. 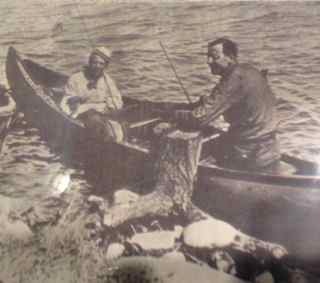 In 1955 Robert and Signe McMichael, collectors of Canadian Art, decided to donate their collection and 10 acres of land with a few hundred pieces to the Ontario government. 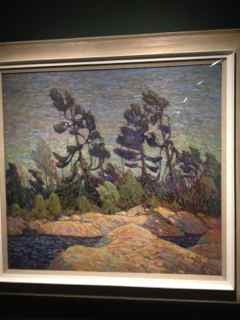 Today the gallery of Canadian artwork has over 6,000 pieces of Canadian artists and extends over 100 acres through undisturbed forest (Group of Seven, Inuit and Native work). Tom spent months alone in the woods. I can’t help but think that if he lived, and got married, his art might have suffered? Maybe I’m wrong. Marriage was a necessity of the time, but with a family and wife, would he ever wonder out into the wildness for months? You can’t leave a family for that long? Naive Melanie, it’s done all the time. But, these are questions that swirl around in my head. What if? 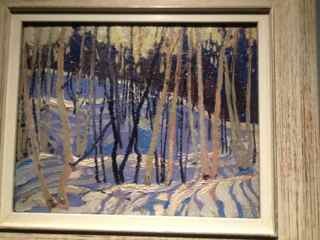 McMichael feels like the perfect place for the Group of Seven’s work. In the gallery you can look outside onto the forest and feel like you’re part of one of the paintings. Driving down the road into the gallery road lined with birch and giant maples, it also feels like you’re in Algonquin Park. To the left side of the road, six of the seven artists are buried in the cemetary–Tom’s in Owen Sound near his birthplace. The gallery is also surrounded by short hiking trails and an outdoor sculpture gallery; Thom Sokoloski’s The Scarecrows was inspired by Canadian explorers seeing Canada on its rivers and waterways. 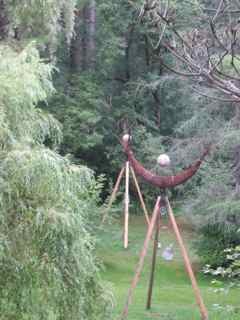 The 15 feet canoe-inspired sceptres remind me of some giant version of the Blair Witch Project–maybe they come alive when it gets dark. Spooky. Driving out of the gallery, I head into the main drag of the town of Kleinburg–cutesy touristy boutiques. I find the local watering hole and begin to write and to wait until the traffic subsides back into Toronto. I think about Thomson. How incredible it would be to have such a single-minded focus in your life? Thomson’s existence was the woods and painting. He didn’t have much time for anything else. And while he tried out the city life in Toronto working as a graffic artist for a few companies, he was pulled back into the forest. Four years as a painter and we’re still talking about him, still haunted by the questions, the life and his art.